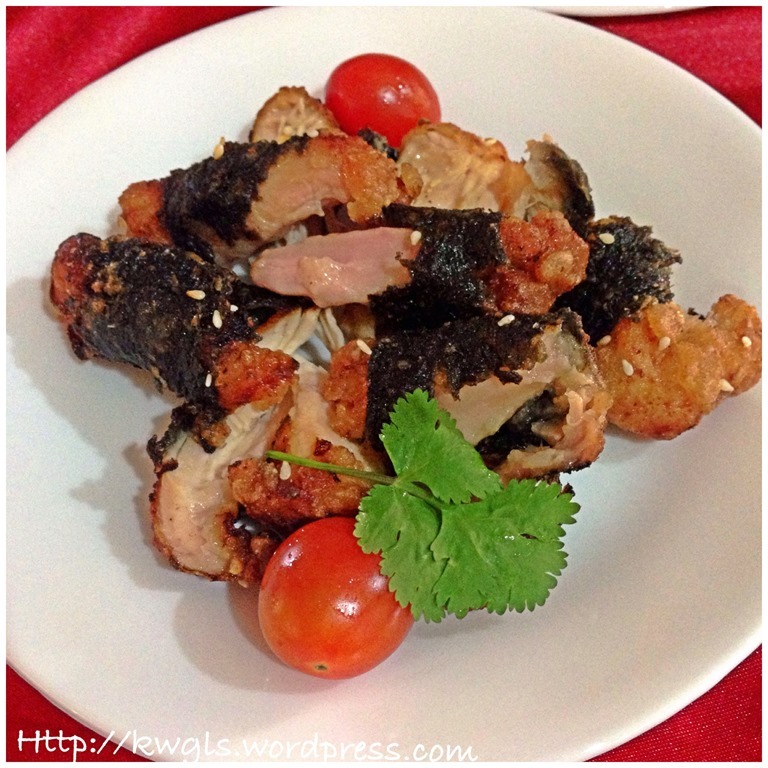 I do not know if today’s post is a real and authentic Japanese cuisine, but it was marketed and sold in Singapore supermarkets as Japanese Crispy Chicken with Seaweed. I have this doubt because I can’t seem to locate any exact recipe on this ready made chicken nuggets dish.. Neither can I find the Japanese name to it. That made me wonder if this dish is just a special dish created by some company and marketed under the name Japanese Crispy Chicken with Seaweed. 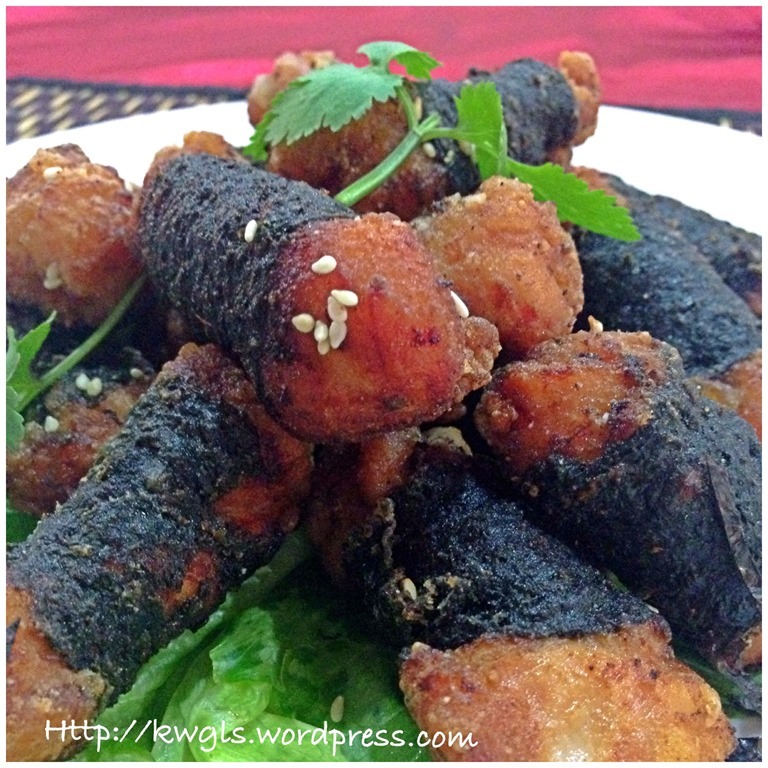 However, for my post, I will call it JAPANESE SEAWEED CHICKEN NUGGETS. Pardon me to be not humble, I believed I have managed to replicate what I have eaten and the similarity are closed to 80% with the ready made version sold in supermarkets. Because of this dish, I have purposely bought the Japanese seaweed Nori, Japanese rice wine Mirin and Japanese soya sauce Shoyu for the preparation. 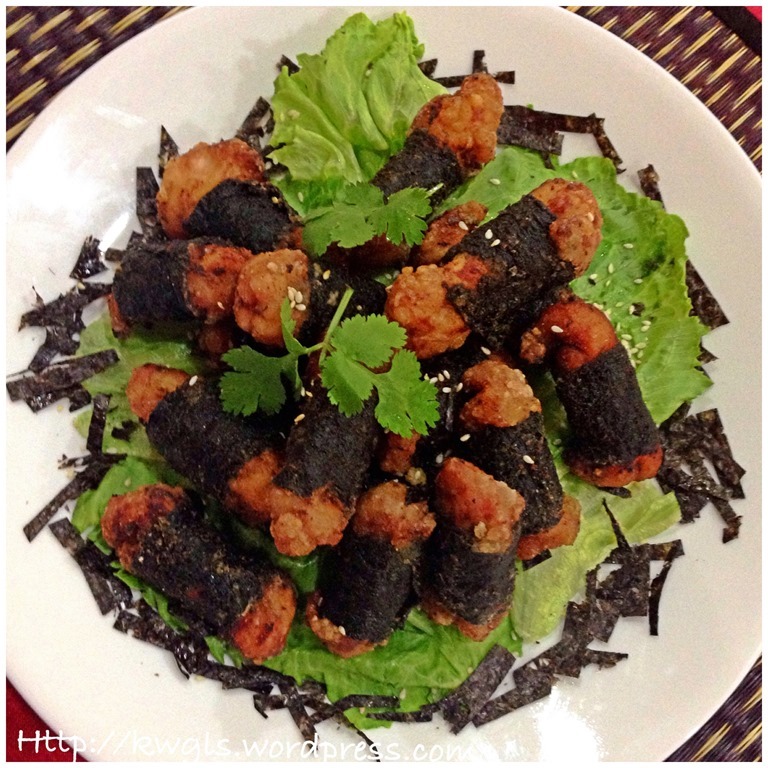 Nori is a type of dried seaweed in the form of a flat sheet and usually used for the wrapping of sushi rolls. Mirin is a type of Japanese rice wine which is sweet but with less alcoholic content. If you asked me, personally I would prefer Mirin than the traditional Chinese cooking wine like Shaoxing wine. As for the soya sauce, these Japanese soya sauces have their unique taste and it is hard for me to describe with my limited English vocabularies, but it resembles the unique soya sauce usually served for the dipping of Sushi. Sorry for my ignorance on Japanese cuisine ingredients as most Japanese packaging do not have English wordings.. However, I am very very familiar with the taste of these chicken nuggets as it is my kids’ favourite and at times, it was served as party snacks. Making this is definitely not difficult at all but a bit laborious. The ingredients are minimal and the steps are simple. However, for a guy of more than 80 kg, doing this is a “tough” job for me because it needs a bit of patience, neatness and artwork.. I am not good at these.. I admit but I am sure a lot of house chefs are able to do better than me. adequate corn flour or potatoes flour for coating. Note: In this illustration, I have used both meats from the drumsticks and chicken fillets but subsequently, I found that drumstick meats are more suitable for the dish and the texture is better like those ready made version. 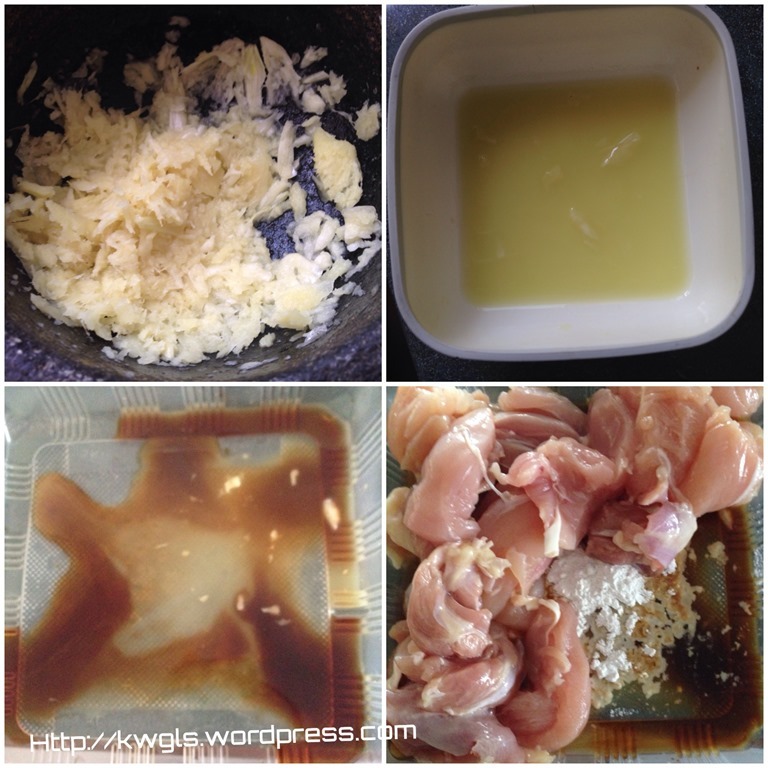 Either pound the ginger and garlic in a mortar or blend it using the food processor until fine. Squeeze the juice and transfer to a plastic container. 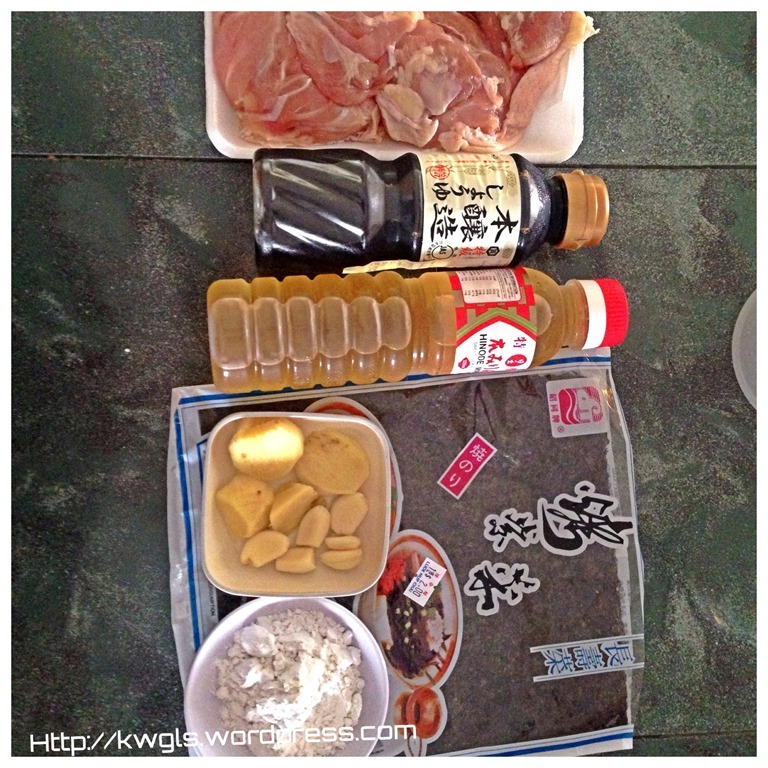 Add in cut chicken meat, Japanese soya sauce, Japanese rice wine, corn flour or potatoes flour and sugar. Stir well and marinate for at least 1-2 hours. Meanwhile, get ready another container, put adequate corn flour or potato starch. Set aside for the next step. 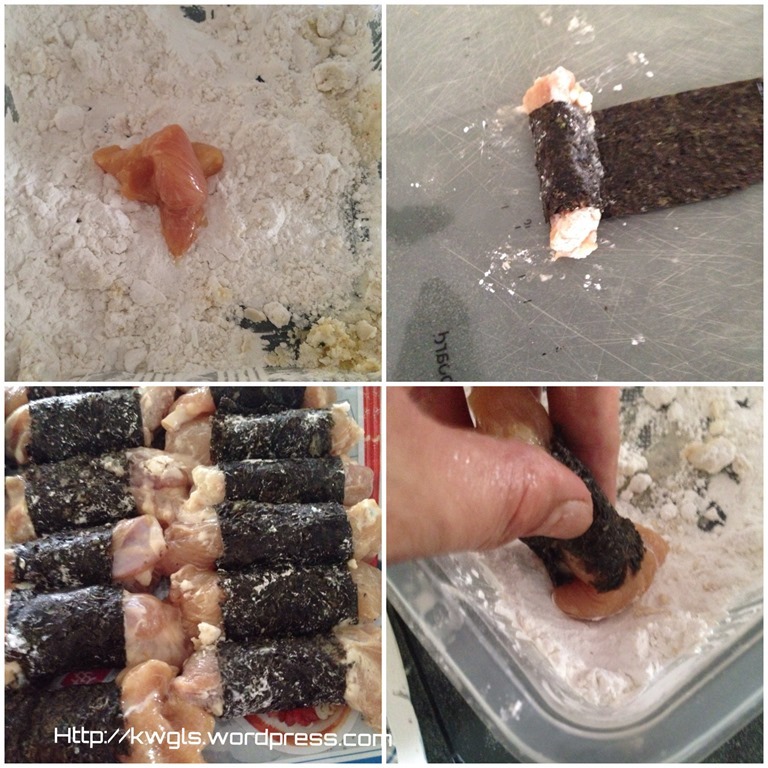 In a flat surface, put a piece of the cut Nori or Japanese seaweed. 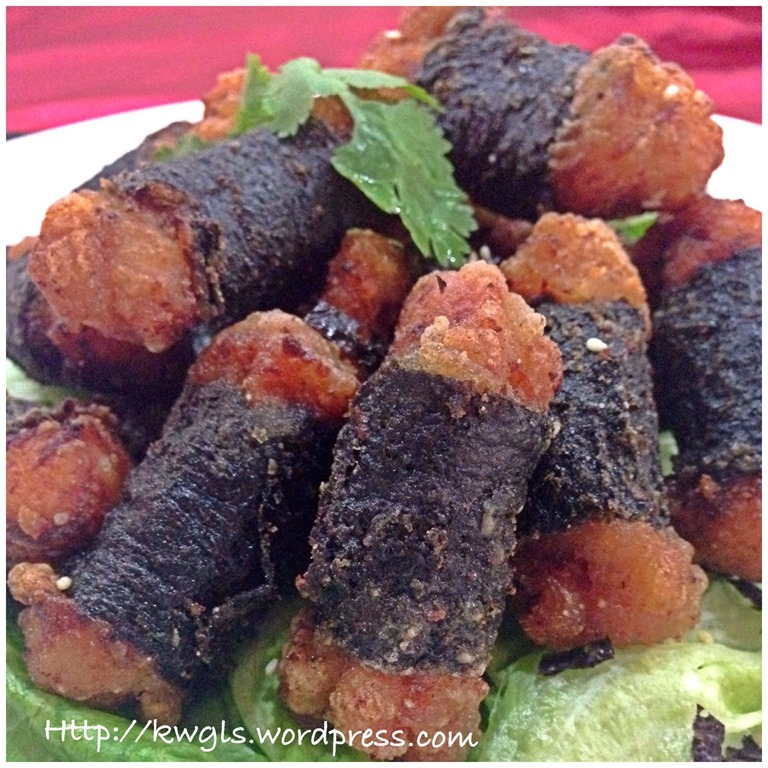 Take out a piece of marinated chicken nugget and coat with some corn flour and place on top of the Japanese seaweed. 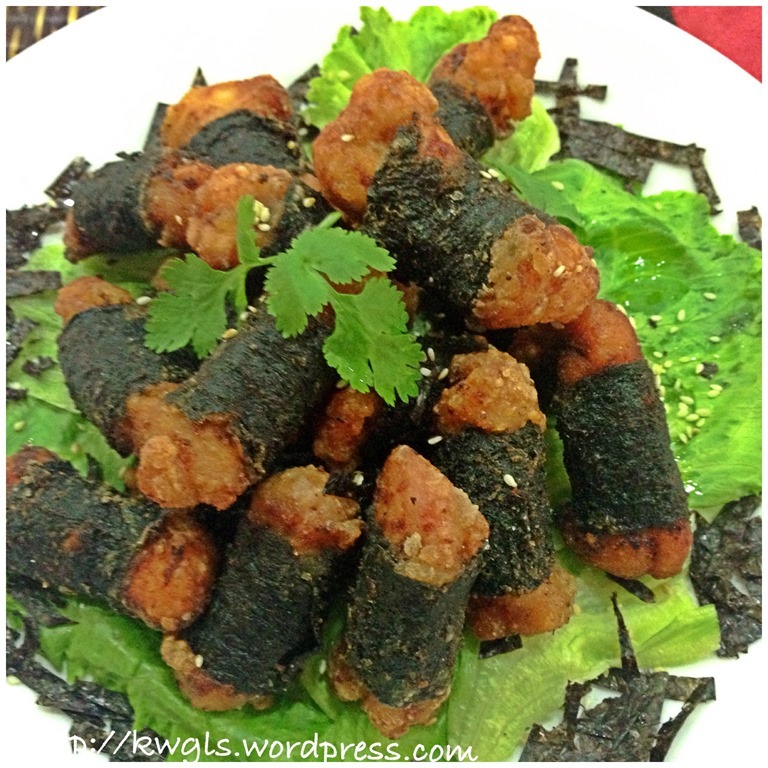 Roll the chicken nuggets with the seaweed. You can put 2 smaller pieces and when fried, the meat will glue together. In a frying pan, heat up adequate oils for deep frying the nuggets. Put a wooden chopstick and test whether the oil is hot enough for frying. If bubbles start to emit from the wooden chopsticks, it mean oil is ready for frying. 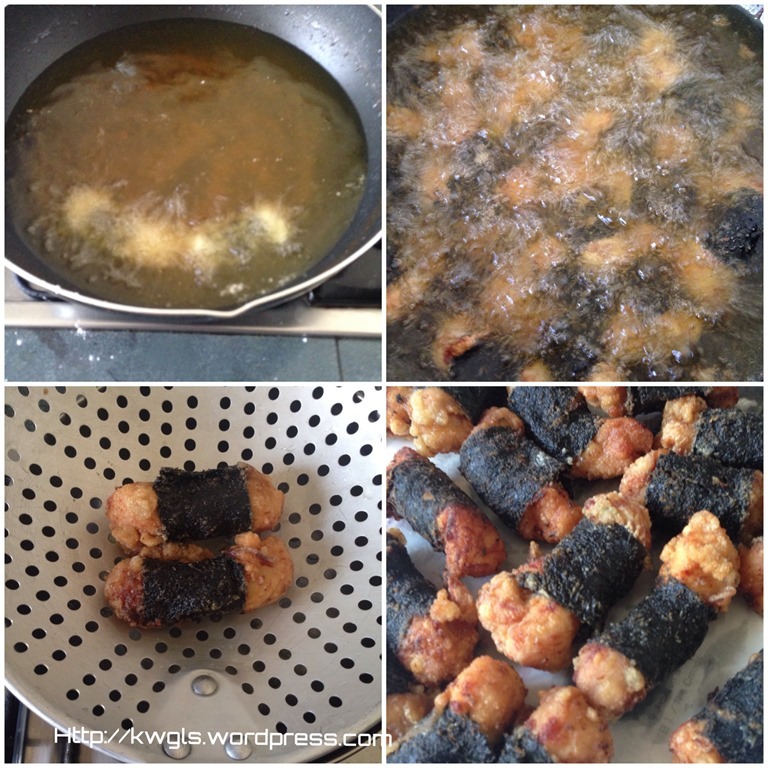 Take a seaweed wrapped nugget, hold the seaweed portion, coat both sides of the chicken nuggets with additional corn flour (refer 4th picture above). Deep fried until the chicken is golden brown in colour. In the process of deep frying, turn the chicken nuggets to ensure that it is evenly fried. The process is relatively fast since the nuggets are quite small in size. If you find that you cannot it handle it, turn to low or medium heat and when the colour is about right, increased to high heat and take out the seaweed chicken nuggets. This is to prevent the oil flow back to the chicken nuggets when the oil is not hot enough. Drain and put it on pieces of oil absorbing papers. Let it completely cool before serving. Best served as a party snack or a side dish and suggested dip is Japanese mayonnaise or Thai sweet chilli sauce. I am very happy that throughout the dinner, my wife and my daughter who did not see me preparing this are not aware that these nuggets were prepared by me. I asked them is the chicken nuggets nice, they said is normal. My wife then asked me, is there any promotion on? If not, why am I buying this? I told them that these nuggets were prepared by me and they looked in slight disbelief and casually remarked, “Well, next time we can save some money and need not to buy the nuggets from the supermarkets!” In Singapore, as at to date, it costs about S$13.95 for about 850 grams of these nuggets and the cost of preparing 500 grams of these chicken nuggets is definitely less than S$5 as the Japanese ingredients used were minimal. May be you should try preparing it too. For those readers who have difficulty to get Japanese cooking ingredients, you can always substitute with Chinese cooking wine, Chinese light soya sauce and without the use of seaweeds. I can assure that it will still be a hit in your dinners or parties. For more recipes, you can refer to my RECIPE INDEX here and you can follow me at PINTEREST or visit this blog’s FACEBOOK PAGE. 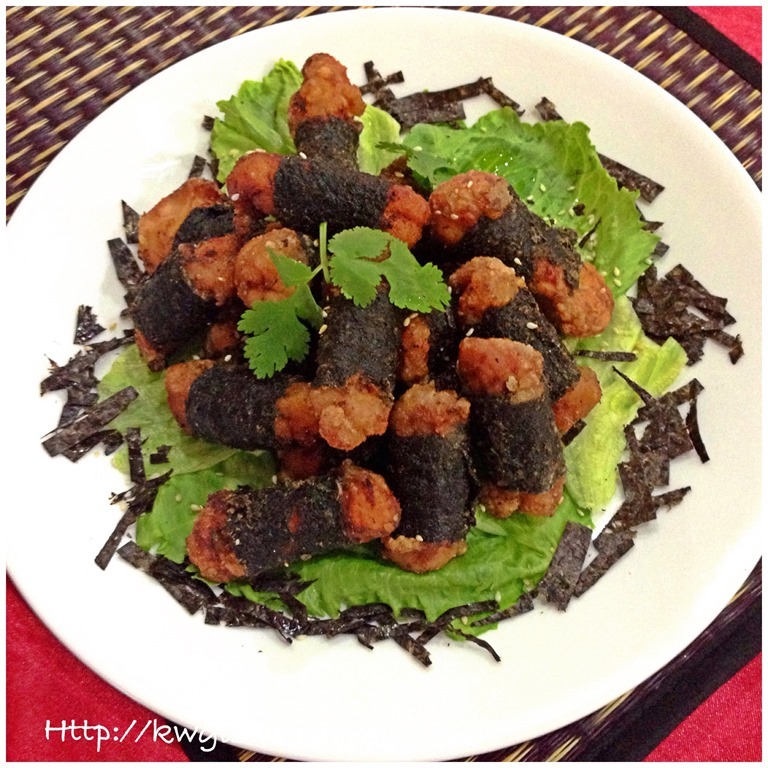 This entry was posted in Dish, Food Preparation Series and tagged 8, Guaishushu, Japanese seaweed, japanese seaweed chicken nuggets, Japanese seaweeds chicken, Karaage, Mirin, Nori, nuggets, postaday, seaweed nuggets, Shoyun. Bookmark the permalink. 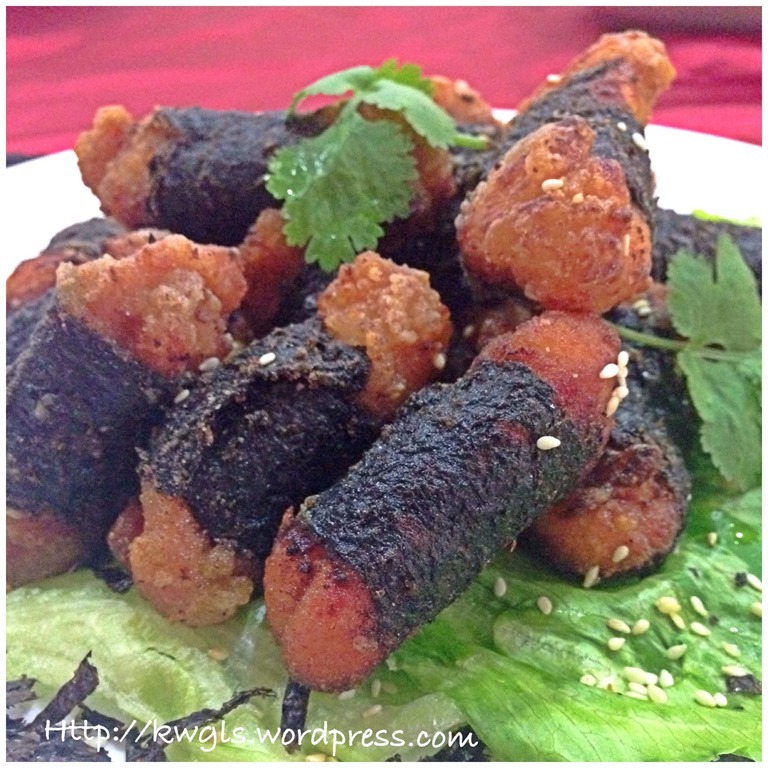 ← Fish Paste + Bean Curd = Presentable Seafood Tofu Dishes! I am not. It is just my passion in cooking. i like to explore as a test to my own abilities.. Thanks for dropping by. Pretty! You make such varied meals. I’m in awe! Kenneth, this may not the Japanese dish as I saw Taiwan chef teaching it in TV. He didn’t dip in flour but sesame seeds. I fried them before. Yummy. 1. Please try not to remvoe the ginger’s skin or any root veggie skin whenever you use as the best part is just under the skin. I cook even Pumpkin with the skin, surprsingly, not hard when cooked. 2. For those don’t have Mirin, add some sugar to some cooking wine. 3. 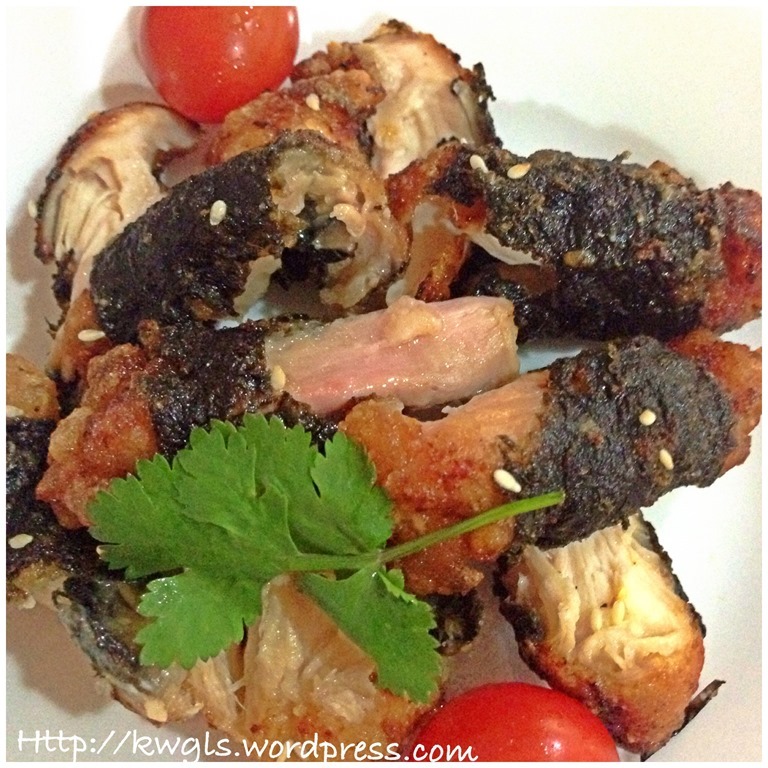 When we marinate any meat especially if we wanted to bake or deep fry, add in some water and corn flour/ tapioca flour. 1 kg of meat can add in 1 cup of water. When you eat it, you can see the juice flowning out , very juicy !! Wow! I’m so happy to have found your recipe. 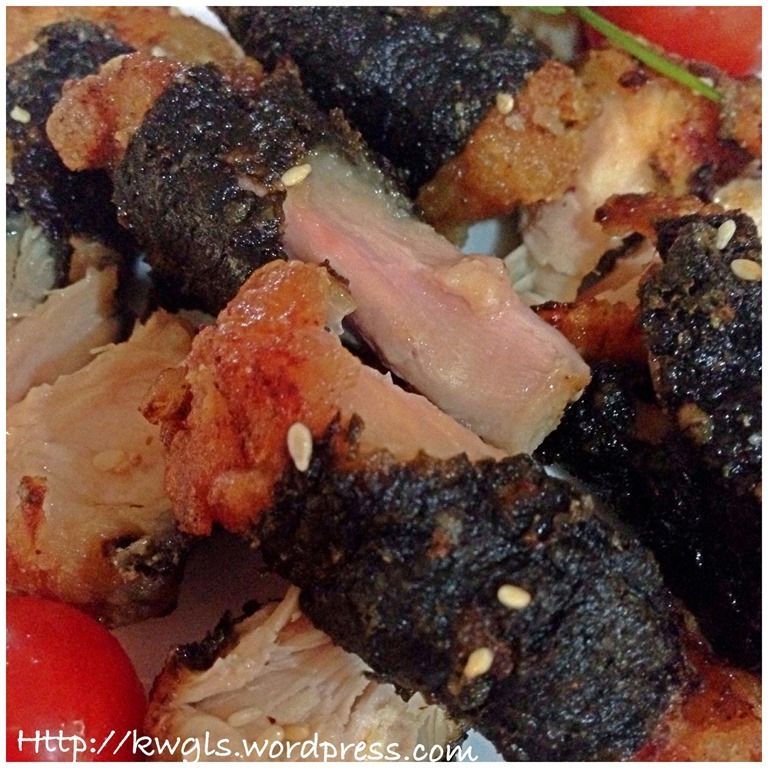 My bestfriend lives in Singapore and we (I, hubby and sons) visited her she served us the Crispy Chicken Seaweed from the Supermarkets. We got hooked and brought home several packs. Everytime my bestfriend comes home here to the Philippines she brings us a pack and my sons will eat it little by little to prolong the supply. But now, thanks to you, I can make it at home and yes, it will be cheaper too! Thanks!